"Photography is my Life. Photography is Cathartic. The world of Photography, the one behind the camera as well as in front of it, accepted me as who I AM! Photography is my Oxygen!" That's what Tanvi D the ace photographer tells me when I ask her," Tanvi...who are the real you!" And why does she answer like that? Because she says that photography has really been cathartic in her journey from being born as MAHESH to slowly being begun accepted as TANVI D -- a transwoman. "I belong to God's own land Tirupathi- the abode of Balaji. But the same land didn't accept me as who I am. I am currently based in Chennai," Tanvi starts opening up fighting back nostalgia...and perhaps a few tears. Her father was a ticket-checker in private transport buses and mother a home manager. When Tanvi was in class ten her father passed away and she took up a job as a labour-on-contract in a reputed tyre manufacturing company. She recalls, "Since the age of eight, I would love to dress up like girls, mimic movie dialogues and dreamt to be a film actor someday. But destiny had its own will. I had a younger brother to educate, I worked as a labourer and aimed to make him a big man. I sent him to study in Chennai, but once when he came home for holidays, he collapsed with a high fever. We rushed him back to Chennai for best possible medical care, but he passed away at a fatal stage of Jaundice. That was the day that broke me from within." And then one day, Tanvi says, fed-up of Mahesh's womanly avatars, the Mother-ship decided to take a drastic course. "My mother pressurized me to get married; I had already lost one parent and not willing to lose her, I succumbed to pressure. We had no cell phones back then to tell my wife the truth. And we were married off. Initially, I had no courage to tell my wife, but one day I wept and broke out the truth. She said she loves me and also that she would get me 'cured of this problem'. After a gap of a few years, due to societal pressure, we had a son and a daughter. But inside us, we knew we were not soulmates, not man-and-wife. I at times feel bad for my children who have no say, no fault in all this nonsense." Tanvi claims that post children, the wife began avoiding the feminine husband. And also claims that a job shift brought the MAHESH as Tanvi to Bengaluru. "I used to stay like a woman in Bengaluru and visit my wife & children in Chennai dressed up as a normal man. This went on for five years. During this time my wife advised me to try medication, counseling etc, etc. I am sure she was worried about our children's future. I don't blame her, I accept that I should have been brave enough not to marry her. But her words, her avoiding me as a human being hurts me," Tanvi breaks down. And I choose to let her speak rather than thrusting my questions into her mouth, "One day I decided to live openly like a trans-woman. And before that I got my wife her own tailoring Boutique - she is quite skilled at that. I wanted her to be independent before she takes a stand to stay with me or part ways. I have children, I cannot run away from my responsibilities." And what about Tanvi's own life? What's the present family situation? Tanvi stays silent on the last question... But yes, jumps onto the next question which was about her latest and most cherish vocation - How did photography happen to her? "Oh, I used to help out in a studio as a spot-boy after my job at that reputed tyre company...to make some extra money. Slowly I began taking interest in the events. And when I got a full-time job, I began saving money. I bought my own camera and starting doing usual photo clicking business. And with passing time I honed up my skills, began upgrading myself in technology and expanded my work which now ranges from Wedding Photography, Model's Portfolios, Food & Event photo-shoots and even some Wildlife Photography," Tanvi details with a chuckle. She also tells me how her daughter, who is eight now, loves to act. Tanvi says she is kind of living her dream to be an actor through her daughter, for whom she even made a short-film as a lead child actor. Her second short film for her daughter won them awards as the best actor and best director at the Kolkata Film Festival. I cannot see Tanvi from behind the phone, but surely can feel the pride in her voice - a proud parent, " My past has been black most of the times, but my daughter deserves the rainbow." Tanvi now comes to another serious aspect of her life, " Mahima, I have now begun my journey to biologically change myself into a woman. I know it is costly. But I also know that for a good future of my family, especially my children I have to make it happen, sooner or later." 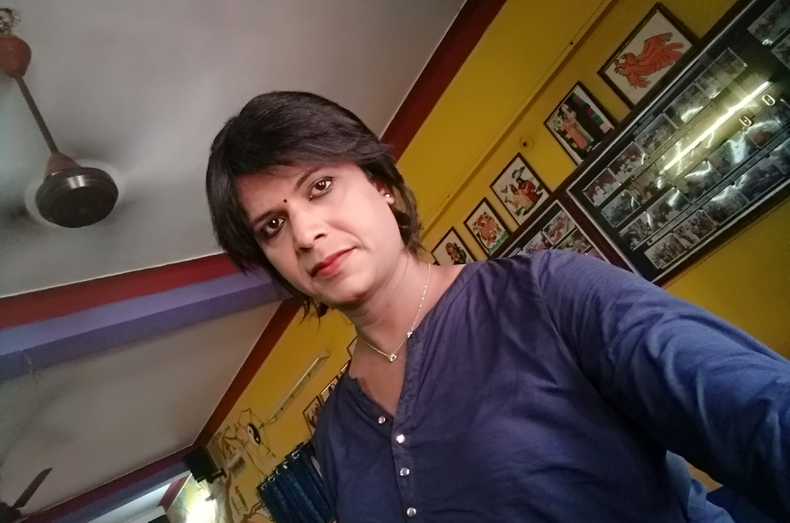 She details that while she was trying to be accepted as a trans-woman in the society, she was hunting for a community space which will not judge her. And that's when SHEROES happened to her, she says, "First of all thanks to SHEROES for accepting me as WHO I AM. And my second thanks to you for reaching out to me for an interview. How many have the guts to write about people like me? At SHEROES not a single person has judged me, rather everyone supported me. I recently attended the Chennai SHEROES Summit. I even set-up my photo-stall there. And it gave me the much-needed confidence. My co-stall friends Narayanee and Anusuya ...and their parents also supported me. SHEROES also opened future work opportunities for me which I can never forget! Big thanks, guys!!" Today Tanvi is an active member of the SHEROES' ART, CRAFT & PHOTOGRAPHY COMMUNITY. So what next Tanvi? "Nothing much Mahima, life goes on. I spend my free time at Orphanages...cooking for them, buying little things that bring a smile on their faces. I just wish...the way these children don't judge me, the same way adults...my clients...the world stops judging us, the trans-community as a whole. People...we respect you as who you are. So please respect our being too. It is as simple as that!" And both Tanvi and I hope, wish it were as simple as this to make the society understand. "All trans-men, trans-women must aim to take up a job. I know it isn't that easy, but if we resolve, and educated ourselves, or atleast skill ourselves, then surely we too will be taken seriously one day. I am an example, and so are a few others. All it takes is a resolve. And this applies even to so-called normal human beings. TO BE RESPECTED, YOU FIRST NEED TO ACCEPT YOURSELF AS WHO YOU ARE THEN START RESPECTING YOURSELF. Trust yourself, if I can start living a dream, so can you...."
That's Tanvi's message for all of you out there, irrespective of your sexuality. So, what's your message for Tanvi? Do share the same in the comments column. You can also follow Tanvi at SHEROES. Keep inspiring...nd make the country proud..
Great Tanvi👏 way to go..Keep rocking. Grt profile, Tanvi. 👍 Good to be who you are! Happy to know the current stage of your life that you're living your dream now. Lets connect personally too very soon if possible. Perhaps one of the most honest interviews that I have done in my entire career. Proud of you Tanvi. Loads of love. This makes me feel so good! Seeing how she is progressing... Proud moment for Sheroes. Keep dreaming and chasing dreams Tanvi. You rock! Heartly Respect to you ... Hats off Tanvi Keep it Up. People should leave judging anyone. Be it Tanvi, be it a married woman, be it a mother, why should the others judge anyone? Great 👍👍Hats off to you. Let me be honest. I almost choked while reading. Yes te society is harsh but you fought all odds and chose to be You. Am happy that you are doing so much for your kids and surely your kids will be proud of you. You are such a beautiful human being and so true to your soul. Wish you success ahead .. May all your dreams come true. ❤️ I have deep respect for you Tanvi. Hats off to you. What an honest person. Deep respect and love. Be yourself, the world will definitely recognize you one day. I am so moved by this story. We often give up in normal situation and Tanvi accepted and faced all challenges openly. She is also aware about her responsibilities and is very clear and focused on her aims. This really needs Guts and I applaud for her. Thanks for sharing her story. Much appreciated and inspiring. Amazing! More power to you!! Can My Daughter Like Dolls And Still Become A Strong Woman?